Delta Sigma Theta Sorority, Inc. seeks to promote academic excellence through scholarship and service. SWDCA Chapter sponsors youth mentoring programs which seek to offer opportunities for youth to learn and develop leadership skills while serving others in their local community. Our youth programs are Dr. Betty Shabazz Academy (Girls ages 11 - 14), Delta GEMS (Growing & Empowering Myself Successfully - Girls ages 14 - 18), and our EMBODI (Empowering Males to Build Opportunities for Developing Independence - Males ages 11-17) Programs. Our Project See (Science in Everyday Experience) Program seeks to challenge young minds to explore things around them. We also offer scholarships for deserving students. For further information regarding our youth programs, please email swdca_ppd@yahoo.com or for scholarship opportunities email swdca_scholarshipcommittee@yahoo.com. 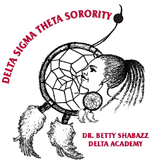 Delta Academy-Betty Shabazz program is a national program developed by Delta Sigma Theta Sorority, Inc. to address the specific needs of African American girls between the ages of 11 - 14. The Delta Academy I Betty Shabazz Program was created “to catch the dreams” of our African-American at-risk adolescent girls and guide their positive dreams and aspirations to a successful future. Empowering Males to Build Opportunities for Developing Independence (EMBODI) is designed to refocus Delta’s efforts to collaborate with other established organizations and agencies to address the plight of African American males. The EMBODI program provides a continuum of services and addresses the specific needs of African-American males.